Ray Brown was undoubtedly one of the greatest jazz bassists ever. He was born in Pittsburgh, Pennsylvania on October 13, 1926 and died in his sleep while taking a nap before a concert in Indianapolis, Indiana. on July 2, 2002. 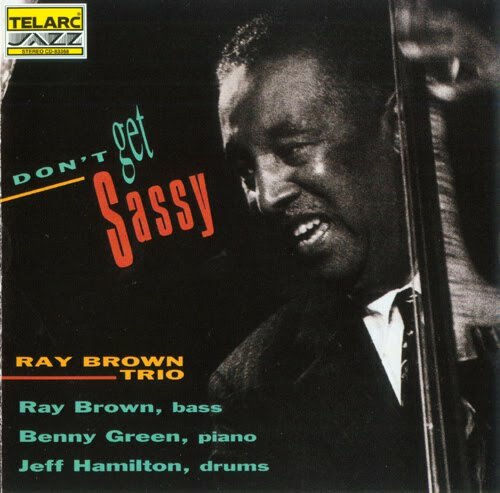 This is not the first time Ray Brown has held the spotlight here at Jazz For A Saturday Night. You can learn more about Ray Brown’s life and music by visiting JFASN #103, which was published here February 15, 2014. In a group like this, the choice of pianist is important because, well, frankly, it’s his show, regardless of whose name is on the album. In this case we have Benny Green, and I don’t think Brown could have chosen a better person to front this outing. “Don’t Get Sassy” opens with the title track, a jumpin’ tune from Thad Jones and Mel Lewis. This one quickly gets your attention (and the audience’s participation). Benny Green may not be known for the flamboyance of his predecessor, Gene Harris, but that does not mean he can’t keep a blistering pace. The guys have the audience delighted, and at the end the audience is not bashful about showing their appreciation. One of Cole Porter’s ballads, “Everything I Love,” is next. This is a quiet little piece of music that is probably better suited for late in the evening, when things are winding down. Next we have “Tanga,” a wonderful piece of music from one of jazz’s many under-sung heroes, Mario Bauza. One thing I haven’t mentioned until now is Green’s vocal comments that are peppered here and there throughout the music. An especially apt one occurs during an extremely short break in the song at about the 1:53 mark. Just before the music resumes, Green issues a warning to “Look out!” At which point the tempo pretty much doubles and Green flat out blasts those keys with a machine gun attack worthy of Dave Brubeck, without in any way sounding like a Brubeck imitator. “Tanga” is a fantastic song, and the execution here is nothing less than superb. I am running out of time, so I’m going to jump ahead to track 7, “The Good Life.” This one was written by Sacha Distel and Jack Reardon. The opening bars are slowly paced and designed to hide the true song that is approaching. We are given a few hints here and there, but that’s all they are, hints. When we are a bit over two minutes in, Green launches into the familiar refrain, much to the audience’s obvious delight. So great is the job Green does with this one that, about five minutes in, you will find yourself checking the liner notes to make sure Gene Harris didn’t slip in for a guest shot. Dizzy Gillespie’s “Con Alma” is next. The quiet yet complex opening gives way about two minutes in. The pace quickens and the discreet ballad gives way to a tune that would have brought down the house. More vocalizing from Green and eventually the guys work their way to the end. The set closes with a Duke Ellington medley consisting of “Rain Check,” “In A Sentimental Mood,” and “Squatty Roo.” A wonderful triplet of songs from one of jazz’s pre-eminent masters, performed by three veteran players who hit the mark every time. To learn more about Ray Brown and his music, noted jazz writer Scott Yanow has a nice bio of him on the allmusic.com web site; NPR has a nice page devoted to him here; the Concord Music Group likewise has a nice page about him; and Billboard magazine published this obit when Brown died. Rude, abusive comments and spam (even those not-so-cleverly disguised as actual comments!) will be deleted. My original content, including photos other than album covers, Copyright © 2014 by Al Evans. All rights reserved.